The circus is back in town! Cirque du Soleil is back in Manila with their longest running show, Saltimbanco. Unlike last year’s Varekai, this show does not come with the Grand Chapiteau; the show is held at the SM Mall of Asia Arena. Though I did get invited to watch during the opening night, it was the invitation to watch the performers rehearse and tour the backstage. 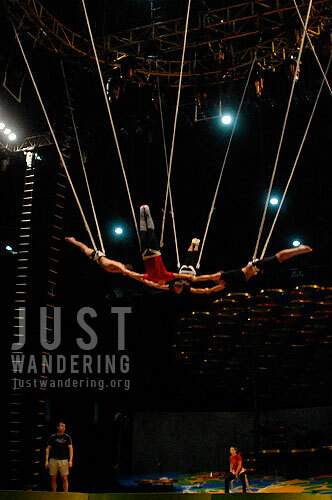 The stage was set when we entered the arena, and acrobats are getting strapped and testing the equipment. Though this is the hundredth (or maybe even thousandth for some), time they’ve done this, they still continue to rehearse and train, making sure their performance is always up to the high standards Cirque du Soleil has set. Watching the artists concentrate and continue honing their crafts, making sure that their bodies are in tip top shape shows just how much passion they have for what they’re doing. Even if Saltimbanco staged in an arena is not as big a production as their touring shows in the Big Top, all their equipment, costumes and props still fill up two Boeing 747 planes. The entire stage, the sounds, lights, training room, and even the wardrobe and props department are all part of their cargo. What impressed me the most about Cirque du Soleil is how self-sufficient they are. Each performer are responsible for their own make-up. What’s even more interesting is that even if they’re doing the same act, no two performer will have the same face (unless of course, it goes with their character). Their make-up are set based on the character they’re playing and their facial attributes. 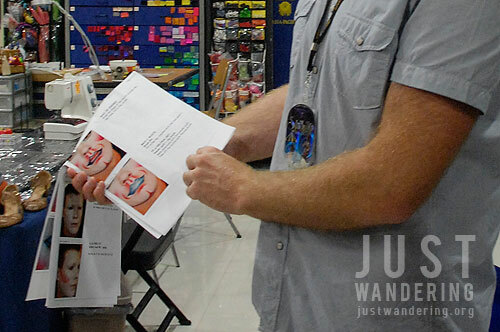 To aid the performer (specially the ones new to the company or not used to putting on make up), each one has several pages long of make up details, which includes photos of the entire face with the make up, and step by step pictures with instructions on how to apply. 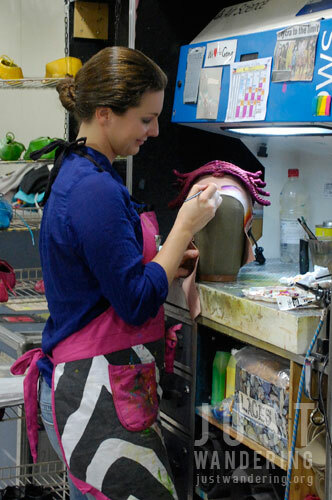 The costumes are washed every night, the head dresses and shoes touched up and repaired daily. Each artist is disciplined; they know they are responsible for their performance on stage. Each one warm up on their own (or with their team) when their act is coming up. They know how important it is to be limber and be on top of their game. Many of them are athletes (mostly gymnasts), while some have always been training as acrobats. Some come from a long line of circus performers. They come from all parts of the globe, some scouted by Cirque du Soleil’s casting department, some who passed an audition. The company has a database of about 5,000 performers, so even if you get shortlisted, it may take a while before you get a call to join the troupe. Every single performance is recorded. That way, they can play back the video and see how to improve on a tricky move. This gives you a clue on where’s the best seat in any Cirque du Soleil show. While sitting near the front ensures that you see the characters up close (and if you’re sitting in the first 5 or so seats, a chance to get picked as a volunteer for their acts), you sometimes miss out on seeing the stage in its entirety, specially if there are aerial performers. When picking your seats, look for the large rectangle. That’s where the sound and technical equipment are, and from what I’ve seen in the TV backstage, where the video recorder is mounted. It’s far enough to fill the frame with the entire stage, yet still close enough that the performers are just a tiny blob. Can you guess what happens here? If you haven’t seen a Cirque du Soleil show, Saltimbanco is a great introduction. It features a variety of circus acts that will amaze and at times, have you squealing in surprise. The Arena has general admission seating, so this show is a lot easier on the budget. General admission tickets starts at Php 900 for adults, Php 700 for kids and senior citizens. Tickets can be booked online at hoopla.ph, or at any of their ticketing outlets. Saltimbanco is in Manila from August 9 to 19, 2012, with shows at 8pm on weekdays, and 4pm and 8pm on weekends. More photos on the Just Wandering Facebook Page. Cirque du Soleil is so amazing! I haven’t seen this show, but I saw “O” in Las Vegas and “Totem” when it was in Boston. One is more amazing than the next! Hi, I really like your blog! We just move to your lovely country two weeks ago, and here I finally could go to watch a show from Cirque du Soleil!!! We went yesterday and we were sooo sooo happy, they were so perfect, every movement, all the make up, everything, the music almost made me cry… just as I imagined…..